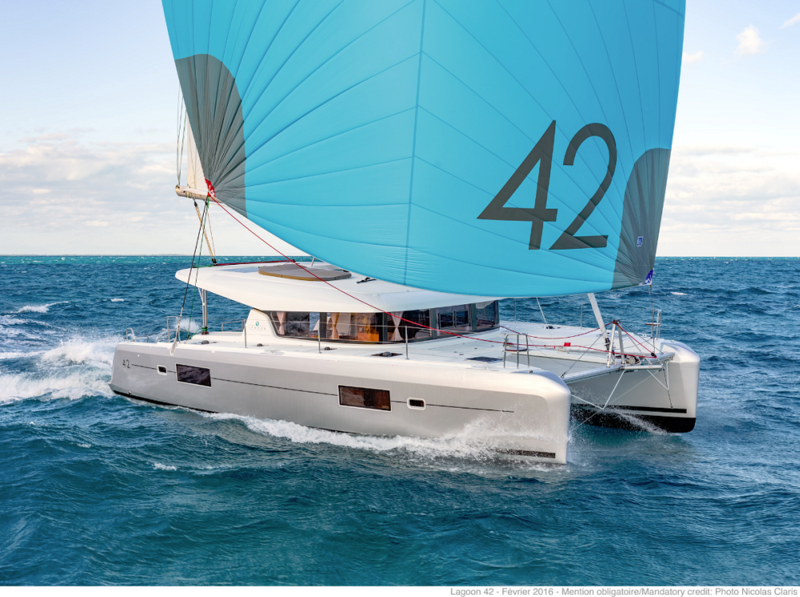 The first time I saw a brand new Lagoon 42 catamaran, I was not very impressed. Just one more ‘face lifted’ old model like many around the boat-building industry, I thought. Lagoon designers decided to replace the old 420 with the new 42 model and impress the audience with a few modern details on the deck and fancy looking interior. 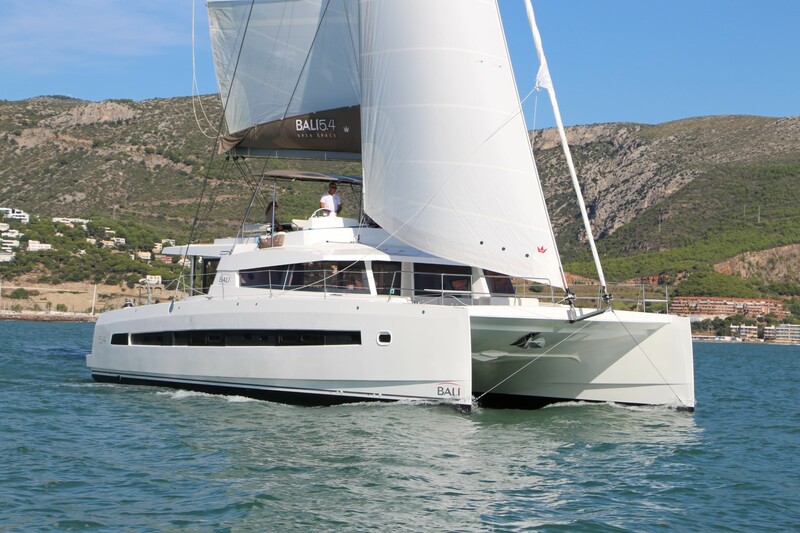 It happened on the Biograd Boat Show when this model was premiered in Croatia. As any new model, it sparked quite an interest, so the exhibiting model displayed was too crowded to be carefully examined. My next encounter with Lagoon 42 was a few months later at the charter base in Rogač, on the island of Šolta in the Croatian Adriatic. It was just after the yacht was delivered, so the base manager was too busy preparing the boat for charter to show me around. He just nagged that he had so many things to do in order to make it functional, so I just passed by waiting for my next chance to test the new Lagoon. Finally, I got my chance a few days ago in the waters around Trogir. My first impression was that I sailed a much bigger cat than a 42-footer. The space, both on the deck and inside, is very well used. First of all, I liked the helm which is isolated from all other (lounge) areas, so that skipper has enough space to handle the sails autonomously. The second great improvement is the position of the helm. It is placed to port from the cockpit, but the major thing about it is the 360° clear view. Yes, it is possible to see both bows, sides and sterns from the same position. A great view especially to the sterns, which used to be quite a problem on other Lagoon models. Exterior designer Patrick Le Quement, along with France’s VPLP Design, made a good job not only by positioning the helm, but also with hull’s curvy lines. The annoying pounding of the rough seas under the gull-wing bridge deck is significantly reduced. Furthermore, the mast has been set aft to open up the fore-triangle, thus allowing more downwind sailing options keeping the weight centred in order to reduce pitching. Mighty square-top mainsail makes it easy to gain considerable speeds in reaching and close-reaching position. 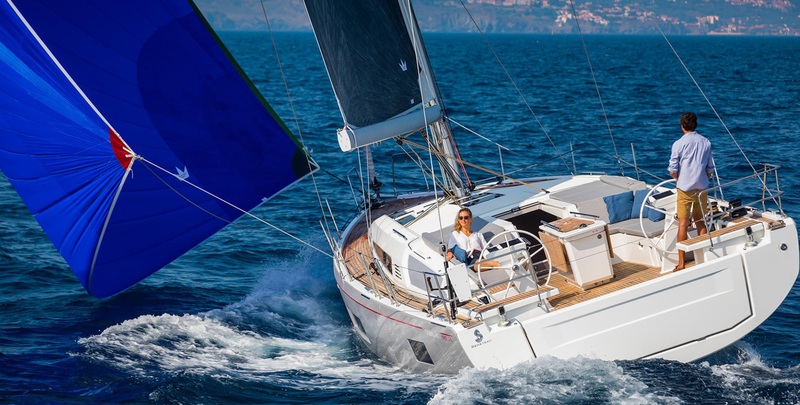 An extra speeding performance is possible by using a gennaker or a code zero since specific rigid bowsprit is included within the hull design. The cockpit is quite low, just two low stairs above the water line. 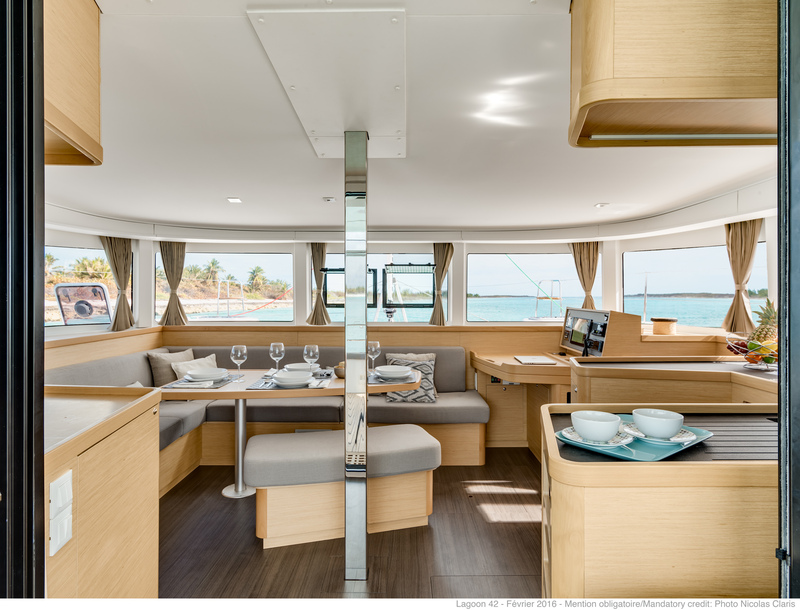 A dining table is positioned to starboard, while small lounge is positioned to port. Transoms are wider than usually on Lagoon models making boarding easier and providing some extra swimming platform area at the same time. Sunbathing fans will find their place on the rooftop where there is a cosy mattress for two. The net between the hulls is as comfortable as always on the catamarans. 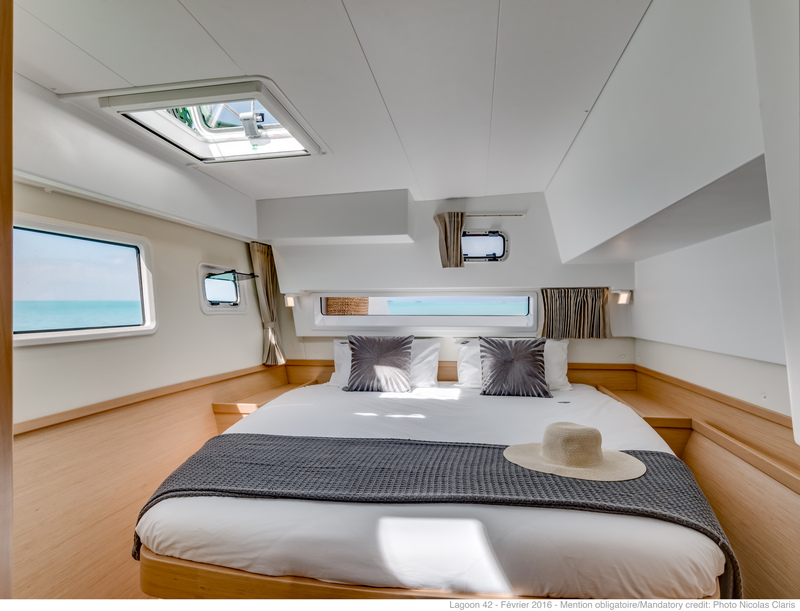 The interior is designed by Nauta Design giving the Lagoon 42 the recognisable Mediterranean style that abounds with open spaces, comfort and a lot of light. 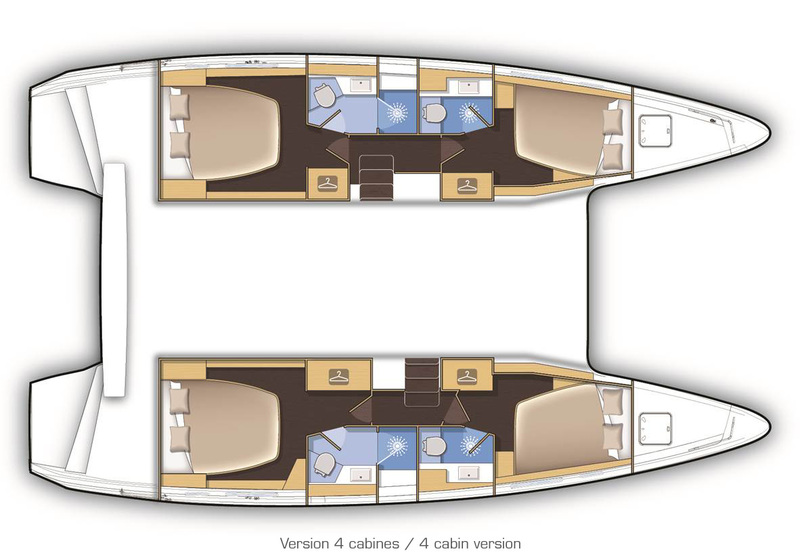 Standard interior layout considers four cabins with four heads. One of the few objections to this model is about the cockpit storage space. There is only one, not too large locker to store spare ropes, water hose, gas bottle, paddles for tender and snorkelling gear. 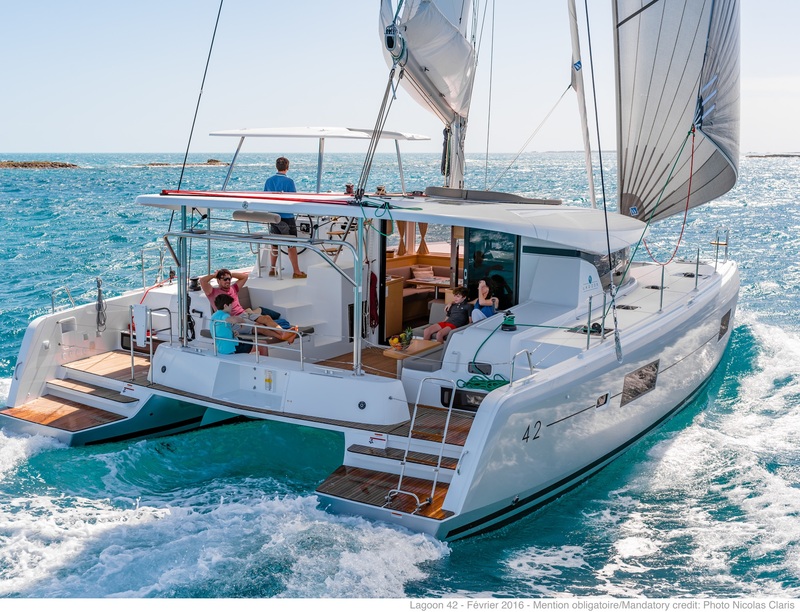 In addition, the model I have sailed is equipped with only one water tank holding as much as 300 L of water – too little for the catamaran that accommodates eight to ten people. 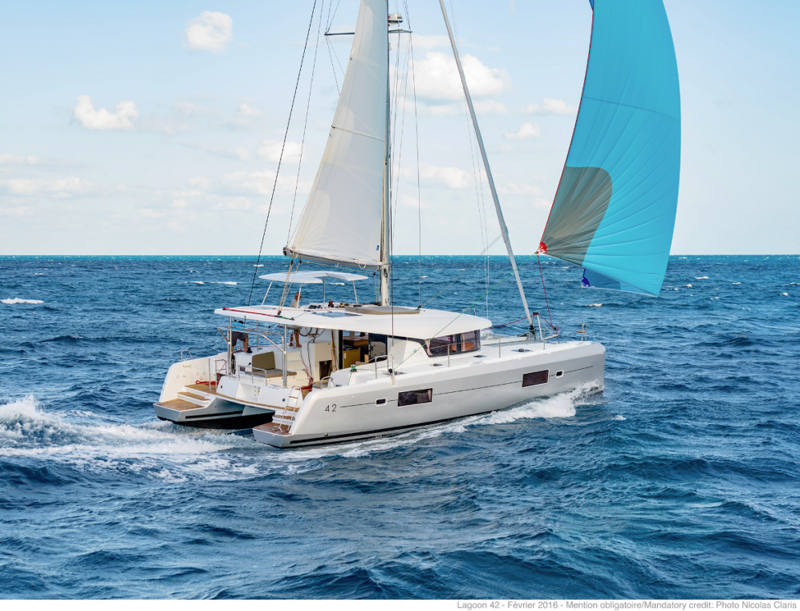 Lagoon 42 is propelled by two 45 HP Yanmar engines with saildrives as a standard. 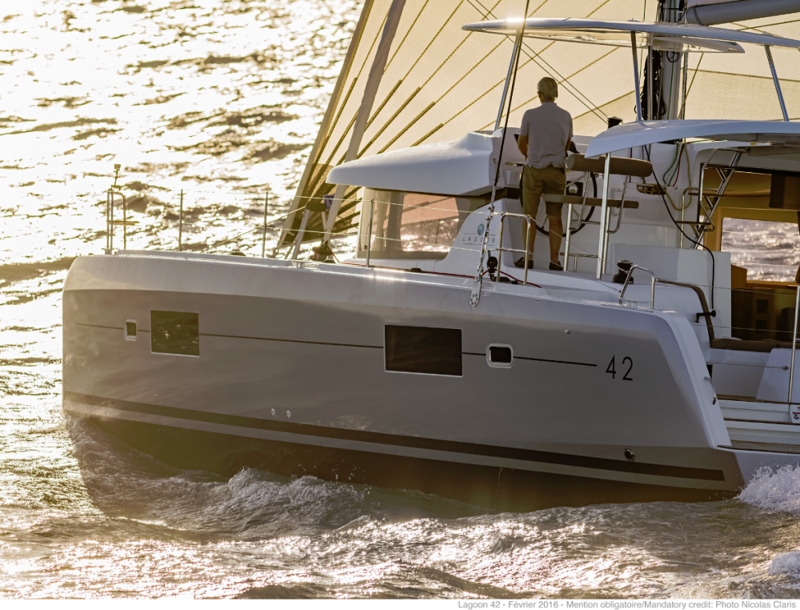 At the end of the day, one might conclude there are much more advantages that disadvantages about new Lagoon 42. It is a very fine boat for its size and price. One thing is for sure, this boat is probably the most elegant of the Lagoon models and provides as much fun as possible in its class.